Food-wise, Dinner remains as consistent as ever. Of course we ordered the Meat Fruit (c.1500) as a starter and the Tipsy Cake (c.1810) as one of the desserts. For any first-timer, these are must orders. Both remain incredibly original and rightly showcase the kitchen at its inventive best. Since this was a repeat visit for me, I decided to order some dishes that I hadn't tried before since the menu is pretty much unchanged from a year ago (although the prices have crept up a bit). They do take items off the menu due to seasonality, such as Powdered Duck, but on the whole, there hasn't been much innovation on the menu front. The terrific Beef Royal, which we had in March last year, also remains a "special". I started with roast scallops with a cucumber ketchup, roasted cucumber, bergamot and borage. Beautiful lightly-seared sweet scallops with a tangy ketchup were served up with small chunks of the so often-overlooked cucumber which were roasted into refreshing little flavour bombs. This was a lovely light dish to begin with. As you can see, presentation is still a strength of the kitchen. 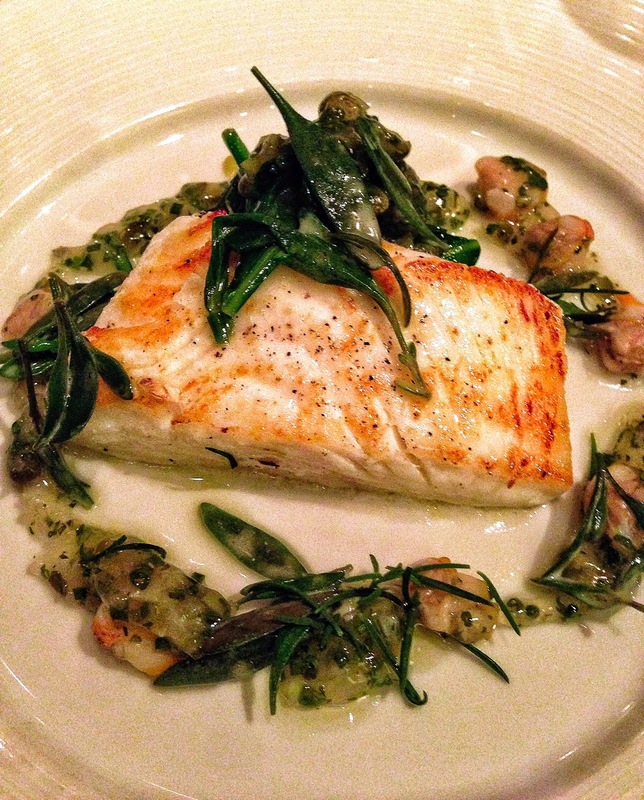 My friend ordered the pigeon as a main course, and I opted for the halibut. I reckon the pigeon, cooked sous-vide (obviously) then seared and served with baby artichokes, remains one of the best things on the menu. Enjoyably rich, but not heavy, the dish is the furthest thing from the Trafalgar Square vermin that you can get. The halibut was gently cooked retaining the integrity of the flaky but meaty flesh. Served with a cockle ketchup and leaf chicory, this was another fresh and light dish. I always order the buttery carrots with caraway seeds as a side dish, and suggest you do too. As well as the Tipsy cake, I ordered the Chocolate Bar for dessert. Our waitress recommended this dish as one of her favourite desserts, but I thought it was just okay. It's essentially passion fruit jam coated in a dark ganache, dotted with a few luxe gold leaves for colour and served with a ginger ice cream to offset some of the richness. Nothing here excited me to be honest (and I love passion fruit), but maybe that's because I'm not a chocoholic. We skipped the post dessert of nitro-ice cream churned at the table since we were pretty full, but I suggest you give it a go. It's another tricksy Heston delight. If anything, the service on the evening we went was the best I've encountered at Dinner, but maybe that's because we were sitting next to a service station and were never far from one of the numerous staff. As I mentioned, prices have crept up a bit compared to a year ago, with the starters adding between £1-£2 a dish with a similar amount added to main courses. Desserts have stayed pretty stable at around the £10 mark. The wine list remains punchy in terms of mark-ups too, although the sommelier is good at navigating the pages to suit your budget. It's not a cheap meal, but with brand-Heston I don't think you should expect bargain prices. Still, in terms of price and quality I think it represents decent value. So what's the downside? Being hyper critical, the bread wasn't that great and came with that slight dryness thanks to pre-slicing much earlier. That's a shame because the bread has always been good on my previous visits to Dinner. It certainly wasn't a patch on the bread at Hedone, which is the barometer by which I will measure bread for as long as I can chew. Also, despite the room being well decorated and comfortable, it's hard to shake the hotel restaurant feeling, particularly when you head through the jarring music in the bar on the way to the downstairs loo. So does Dinner live up to its one Michelin star status? Will I continue to recommend it? Yes and yes. When my Aussie friend was leaving London I asked what his favourite meal was and he picked Dinner. This is partly because he had few preconceptions before the meal apart from my recommendation, but clearly the whole experience - top-notch food with just the right amount of Heston magic - can't fail to conjure an enjoyable evening. For me, it's hard not to be won over by the food and the strong and generally knowledgeable service. And frankly, it's also a joy to just order three courses, and not have to endure another over-long tasting menu. For my original thoughts and more pics click here.